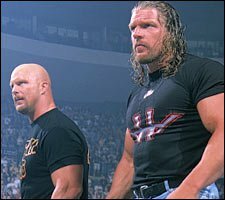 The latest big podcast to be endorsed by the WWE has given Stone Cold the chance to grill the current COO of the WWE Triple H. To be honest it wasn’t a let down for me they discussed quite a few topics that were very interesting, it was nice to see a different side of such iconic characters in the wrestling world. I would like to say though I had my doubts about watching this podcast because I had been watching RAW and to be honest with Triple H in character on the show I was wondering how good it was actually going to be. However I had no need to worry the characters were left at the entrance and it was quite a frank and honest discussion, about how the fans react and how Triple H is finding his new role. Part of the discussion was the most interesting for me was when Stone Cold asked about Steph and for all intenses purposes asked Triple H (HHH) whether he slept his way to the top, and it was quite cool of HHH to admit he probably wouldn’t be where he was without Steph but at the same time he would have still worked his way up to something else in the company. He highlighted that he worked hard and paid his dues before he got with Steph. He also discussed the current talent, future talent and the way in which the business has changed and developed. Highlighting when he and Stone Cold was at their highest they would know their demographic where as now the WWE caters from 8-year-old to 50 year olds and that’s why things have had to change. Also with the World Wide exposure it now gets and the way people communicate online it means that things have got to change constantly in order to keep the audience happy. He admits that there quite a lot more fans that understand when they are pushing a talent and when they are holding them back, along with understanding when they are ready and when they aren’t. One of the major thing for me with all this said though was his admission that the Hall of Fame wasn’t just based on what you have done for the industry. It is also based on your suitability as such he admitted without actually saying it so many words, that Chyna deserves to be in the Hall of Fame but because of her choices after the WWE career for that reason they will not be inducting her into the Hall of Fame, although not as definite than those words but that was the feeling I got. Is this right or wrong I am not sure.